and throw handfuls of dough..."
For this animal-loving, book-reading little girl, there is nothing so satisfying as imagining her own personal menagerie of zoo animals with very special and specific talents. Have you heard about the shark that is a bibliophile? Or the ox that loves working in the kitchen so much he takes a job as a short-order cook? How about skunks that jump rope? No??? Why, you need to read this book! Rabbits would ribbet and hiccup and burp! while trying to calm a hysterical fly." There is surprise with every turn of the page. 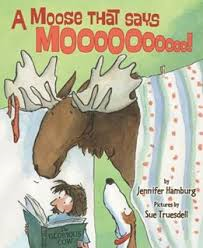 Sue Truesdell interprets the wild antics in images that are constantly moving, filled with expression and sure to inspire giggles and guffaws. 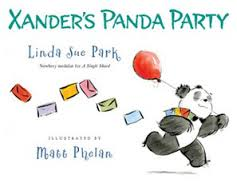 She helps young readers to see all the possibilities for the imagined denizens of this very wild and wacky zoo using watercolors with black ink outlines. The silly signs, a cluttered background and charming animals are just what the doctor might order when considering an entirely unique environment for the imagination. stars light up the sky. I like books that help us understand other cultures of the world. While the Moon Festival celebrated by Chinese families happens in the summertime, now seems a good time to be talking about special family times. 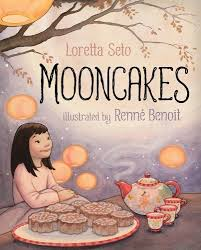 Our narrator is a small girl and she helps us understand the joys of the festival itself...looking at the moon, paper lanterns lit by tiny candles, tasty mooncakes and stories told with love. She is happy to share her family's traditions. 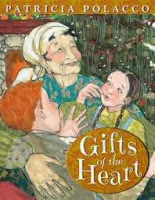 Hers is a lovely story told with all the gentleness that family times evoke. 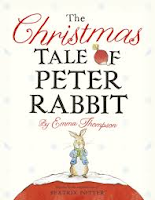 Included in her narration are three traditional folktales from China: they concern a cruel man who mistreats his wife until she finds a means of escape, a sluggish lumberjack who can't cut down a cinnamon tree for the life of him, a selfless rabbit who offers to save three magicians from certain death. The paintings that accompany are just right...they are equally quiet, using soft colors and moonlit images of the family sharing the spirit of the festival. The feeling changes as the story switches from the traditional tales to the food being shared. 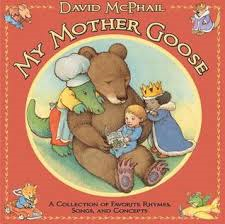 It is magical and touching, and very exciting for our young narrator. A cozy chair, a cup of tea and a mooncake to share with a loving family! While I make no bones about cats not being my pet of choice, I have often voiced the wish to come back in my next life as just that...a cat! I would love to lie in glorious sunshine and bask in the care people give to keep their finicky feline content. If you know cats, you know that they can sleep almost anywhere that seems just a little bit cozy! But, what happens when a new and irritating kitten arrives on the scene. Intent on having company, the little one is relentless in waking Nat, all the while hoping to share good times. When Nat awakens (which he does every night when the house and its inhabitants are sleeping), he plays his part in schooling the young 'un. That only lasts as long as the little one has the energy to play. After that, there is only energy for napping. 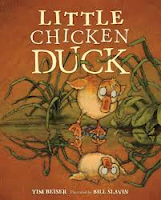 The text is just right for little ones, and for those wanting to read books on their own. It evokes movement, and typical feline behaviors. The mixed media artwork (pencil crayon, watercolor, gouache, acrylics and glaze) adds charm and delight to the reading. The bright colors and textured images are sure to interest young listeners, while adding a parallel story to the one told in words. They are sure to want to hear it again and again. So, be prepared! "Boys in turbans on donkeys go. Men in white boubou stroll. Nothing but dark eyes show. 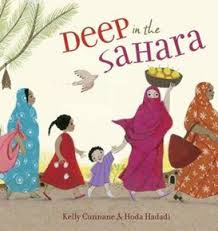 Well-written and beautifully illustrated, this is one of those books that allows those who listen to learn about other children of the world, their culture and customs. We are better for sharing it, and made more aware of the Muslim faith. It is a celebration! Lalla is just like any other young girl in our world. She wants to look like the women she admires. So, she tells her mother that she wants to be as beautiful as she is, and that means wearing a malafa. While her mother agrees that the malafa is a thing of beauty, she assures her beloved daughter that it is so much more than that. as blue as a stranger's eye." Now, she is ready to share the evening prayer with her mother. This is a lovely look at Mauritania, the people who live there and the bonds they share through their faith. The writing is descriptive and warm. Lalla is free to wander throughout her village with family, learning what her elders have to teach. The second person voice allows us to learn right along with her. 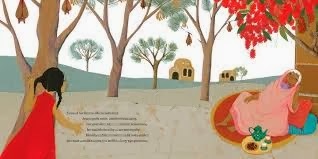 The illustrations celebrate the beauty that is there for all to see...in jewelled tones and detailed community life. Using cut paper, and a knowledge of the beauty in the fabric, Hoda Hadadi gives us a loving look at the young Lalla's daily routines. one that's right for you. You've got the train's attention!" We have seen a number of books about trains this publishing season, and every single one I have read is worthy of your attention. To add to the delight of the holiday hijinks, a train might be just the right kind of pet for your family! Did you know that you can train a train? I did not. 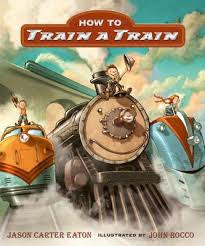 So, Jason Carter Eaton sets out to show me (and his readers) just exactly what to do to get that train to do what you want it to do! In this 'handy guidebook' he presents every conceivable means for choosing, tracking and training one. If you have never considered such a thing, you may find yourself changing your mind. It depends on the type of train you want, of course. Once that absolutely essential question is considered, you have to catch one! There are many ways...some tried and true, some not so. But, you have to start early and be very, very patient. When you know it is the right one (and you will know! ), lead it home. There will be no way to call your pet train, unless you give it a name. Once you have spent some time together, you are sure to find a name that suits its personality...some suggested ones are Little Miss Muffinhead, Milo, Smokey or even Pushkin. You're sure to find the perfect name after careful thought. It takes a lot of training. It is possible. So, give it a try! If that doesn't yet entice you into checking for this new book at your local bookstore or library, let me tell you a bit about John Rocco's artwork. You know I love it. This just ups the love! His digitally colored graphite illustrations add wonder to the whole idea. His trains are created to scale; they maintain their immensity while also showing winning expressions that keep our focus on their propensity to meet the many guidelines that make them good pets. The pages are filled with images that are sure to have those who love trains dreaming of owning one. "Then John Rocco got involved. And the rest is beautifully-drawn history. We were all huge fans of John’s work already, so to see his vision of my words was not only an honor but a real thrill. He also made it easy for me to slip my kids into the book...That man knows how to bring anything to life in the warmest and most striking way possible. His is exactly the right style for this story—whimsically realistic and larger-than-life—"
"So Anja skied after the patient bird, who led slowly so the child could make her way through the deep snow. When they came to a mountainside, Anja flew so fast over the sparkling powder that the bird could barely keep up with her! At the foot of the mountain the bird whistled, and they were greeted by a giant horse." Anja will need her friends to help her on her quest to be one of Santa's Elves. She has always dreamed of being able to assist Santa, and lives in the perfect place for it. It is a winter wonderland outside, but cold and even a bit dangerous. With a careful plan in mind, Anja will try to find Santa. Before she goes, she ensures that her elderly neighbor has what she needs, and that all of Anja's gifts are delivered to her family and friends. So that no one worries, she leaves a note of explanation and promises to visit when the work is complete. She knows the route to take; and so, she sets off. A tiny bird soothes any worry about losing her way when it promises guidance and company. The going gets tougher, and a giant horse offers a ride for a day and a night. Following a night filled with the wonder of the northern sky, Anja must say farewell to her trusty companion. He, too, has a friend who can be of assistance in the quest. A musk ox has promised safe passage 'under the glacier to the tundra'. On they go. Time is running out, and Christmas beckons. From the ox, she is given into the giant paws of a majestic polar bear. Together they travel over the tundra, resting and reading when the need arises. "I have been waiting for you. You are an extraordinary little girl. While there are many children who wish to be one of Santa's Elves, you are the first to have come this far, and you are already my most important helper. You bring kindness and joy to those around you all year long. Thank you." Isn't that the magic of Christmas? This is a lovely family project. Dad is the photographer, Mom is the writer and their lovely wee daughter Anja is the focus of their story. "Kay Lamity made us a fine dinner that night. All the cooking had fallen on Grampa after Gramma died, and now Momma didn't get home till late. We'd been living on scrambled eggs! Kay Lamity made fried chicken, gravy and mashed potatoes, with some corn that Gramma had canned last spring. Dessert was best of all -scrumptious bread pudding!" "And I play the meanest game of checkers this side of the sweet Mason-Dixon Line!" "Bet you can't beat me," Richie whispered. "Can not!" he challenged with a slight smile. "Well, slap my face to the side of a hog and let him roll in the mud. Missing Gramma doesn't change. The children, their mother and Grampa ache their way through each and every day; but Kay Lamity brings a sense of order and strength when it is most needed. Richie and Trisha are familiar characters for fans, and it is good to see their spirits intact despite their loss. "A gift of the heart ain't opened by pullin' on a fancy bow or rippin' pretty paper off a box. It's about openin' your heart...and givin' what's inside. That's the greatest gift of all!" Of course, there is turmoil. Richie is the big brother after all. He knows much more about Santa than Trisha does, and he's willing to spill the beans. It takes some careful thought and quiet guidance to figure out how he can make amends. 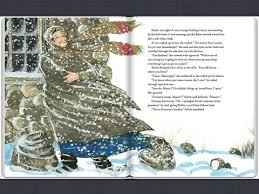 I am such a fan of Patricia Polacco's family stories. Her art is quickly recognized in the scenes she creates showing the siblings peeking in the toy store window, wrapped in Kay Lamity's warm embrace, together in the snow and star watching. She creates perfect winter scenes, shining at night and in daytime light. Her characters are familiar and wear their emotions on their sleeves. Kay brings a calming spirit to the household and wraps each of its members in a warmth that helps to soothe their aching hearts. The magic of Christmas? I think so! his tail curled with happiness." Oh boy, Vinnie is one of those characters who make you tired just watching him! He is intensely happy, and cannot contain his joy when he meets Bogart, a lumbering introvert. There could not be two animals more opposite in nature. Vinnie is oblivious to Bogart's obvious reluctance in the face of Vinnie's exuberance. 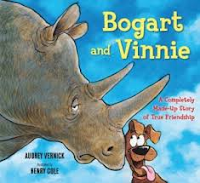 It's tough to know what draws the dog to the rhino, but it is clear that Vinnie loves his new best friend right from first spying him standing alone at the top of a small hill. Bogart has no such initial feelings of joy when he hears Vinnie chattering happily, and has no need for response. "That was okay with Bogart and Vinnie. Because they had formed the kind of family where one member loves the other and one wants nothing more than to be left alone. But, still, a family." The surprise ending is the perfect touch! Henry Cole puts acrylic paints, colored pencil and ink to good use when creating these most charming characters. Their expression-filled faces are 'spot on!' Every page insists that attention be paid to the parallel story as Vinnie talk, talk, talks to anyone and everyone. There is so much going on...filled with humor and delight. I can hardly wait to get into a classroom to share it...there are sure to be giggles and guffaws. "That evening, Red Knit Cap Girl calls out gently to the Moon. "Moon, we are trying to find Polar Bear Cub's family. Can you help us?" Moon smiles and says, "Polar Bear Cub doesn't belong in our forest. You must take him to the North, where there is ice and snow and it is cold all year round." 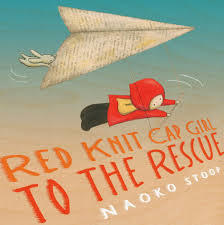 I trust that you met Red Knit Cap Girl in her first book...she is a charmer. In that story she spent time with her forest animal friends and her fondest wish was to talk to the Moon. Luckily, she did that. So, in this story, she counts on that friendship to help her with a dilemma. In the beginning, she is busy with White Rabbit, Bear and Squirrel creating kites, boats and telescopes from recycled papers. They are having great fun. Then, they spot an SOS, and spy a stranded polar bear cub floating by on a small bit of ice floe. 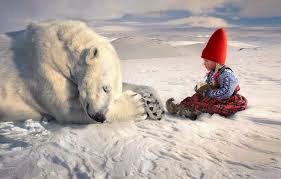 Using her wit and the materials at hand, she and White Bunny tug Polar Bear Cub to shore, a much safer place for him. Knowing that his family will be frantic to find him, Red Knit Cap Girl turns to her friend Moon for guidance. Moon is quick to respond. With disarming ingenuity, the friends design a boat on a much grander scale than the ones they had played with earlier, and give it a sail to help with the long journey. They all climb aboard and, using the moon as their beacon, they sail through stormy seas to the land the Moon had described for them. The end result is certainly worth the effort! Using acrylic, pencil and ink on plywood, Naoko Stoop treats us to a world that is simple and subtle. Yet, there is depth, and you can almost feel the textures on the lovingly designed pages. If I had to choose a favorite, I would choose the wonder of the northern lights; but that is a very difficult choice, since each page has its own special appeal. ...and rips open a termite nest. holding its web by the corners. Yes, I have sung their praises before today, and not too long ago it seems. Adding to the already stellar list of books they have created to entertain and enlighten children, Robin Page and Steve Jenkins bring a selection of 26 animals to our attention. It seems each likes to turn or hang themselves upside down for a wide variety of reasons. The blood rushes to my head just thinking about it! They use pop-ups, wheels, flips and pull tabs to help us understand what is so special about life in such a state. You know about the pangolin and the net-casting spider. That is only a taste of what is included in these detailed, fact-filled pages. They come from all over the world, and their antics are of great interest. Their acrobatics are sure to entice. It is a lively collection. The design changes on every page, and assures return engagements with the animals included here. 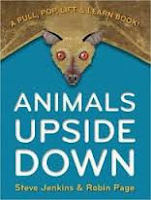 While you move from forest to ocean, and from ceilings to ponds, you will learn a great deal about why birds and animals find themselves looking at the world from an entirely different perspective than most of their species. It flops over, sticks out its tongue, and lies still. An unpleasant smelling liquid seeps from its rear end. Sometimes a little blood even trickles out of its mouth." It certainly sends a message. Steve Jenkins astounds with his accurate cut and torn paper collage images. The captions add to the interest as they curve and wobble, always capturing the movement of the animal they are describing. There is further information added as the book closes, concerning habitat, size and sustenance. eyes and wished a little harder. bigger than me," Roland said. "And I'm not very big!" For many people today, bigger and more expensive does seem to make everything better! There is no time when that is more evident than when it comes to buying gifts for Christmas. No longer content with 40 inch television sets, people battle huge crowds for a great deal on a 70 inch one to replace that less appealing one! Roland has learned that lesson from somewhere. Filled with excitement, he bounds down the stairs on Christmas morning, and is stopped short when he sees a very tiny present with his name on it. It is definitely not what he is expecting. Not content to accept the slight, he promptly closes his eyes and wishes for something 'more'. With each successive 'bigger' gift, he remains discontent. "I WANT A BIGGER GIFT!" Nothing on earth is good enough for him now. That means a rocket ship and a search through the universe! When he realizes how far he is from home, he is overcome with emotion and wants nothing more than to be back where he was before all the wishing began. There, he receives the best gift of all...home and family. There is something so appealing about Peter Reynolds' signature visuals and hand printed books. I fall in love with them every time I read one. He is able to capture feelings and character with little details, and his use of white space is spot on, allowing what is most important to be front and center at all times. 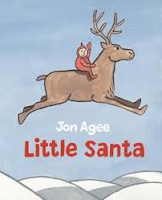 This new Christmas tale is a heartwarming and welcome addition to my collection of books from this fine artist! "The cart seemed to rattle along for hours, as the Human stopped at every recycling bin by the road. Rory began to feel hungry. He was about to dip inside his pouch for a snack, when he suddenly picked up the scent of something better. He stuck his nose out from under the cardboard. 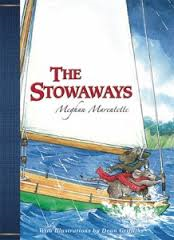 Human shoes clacked loudly on the sidewalk as they rushed..."
The Stowaways are something special...we learn that right away! They are brilliant members of the mouse family; but, they are not just the same as any other mouse. They are rare in the world. They have striped tails that are furry. And, their ears are huge (for a mouse, that is!). "He knew his own life was meant for adventure, and that's where his thoughts always roamed. After all, the Stowaways had always been known as great explorers and he was sure that one day he would become a brave adventurer like his ancestors. Only one thing stood in his way - their father." Mice are in constant danger, and Papa is concerned for the well-being of his family. After all, Grampa is no longer with them. Gran is sure that he is alive somewhere, telling the family that he is too smart to be eaten by a cat while on another adventure. Papa wishes his mother would just let go of all hope. Rory wants to know what really happened to his grandfather and his Aunty Hazel. They were together when they disappeared. It's summer and Rory is set for adventure. He gets just what he wants, in a series of events that lead him to find his grandfather and his great aunt, and to make a number of discoveries that will surprise and delight his family and yours. It is such great fun to see the world through the eyes of these tiny creatures. Young readers will be captivated by their ways, the dangers they face, and the methods used to get themselves out of trouble. It's especially fun to hitch rides on car bumpers, and the axles of carts...all the while keeping out of sight. Or, to find yourself in a science lab facility where the captured denizens get to have their say about what is happening to them. Dean Griffiths adds dramatic visuals that help us see their world through his expressive sketches. It's a great read for the family or for the classroom. There is certainly fun involved, and excitement, and even a bit of tension. What more can we ask? Long winter nights or January afternoons at school just beg for a fitting story to share. This could be it! full of his own importance. That is how they come to meet William, who struts like a peacock and is quick to share the wonder of living with the McGregors. They never ask him to run errands; instead, they offer treats every day and 'nothing is too good' for William. He even lets the young rabbits know that the McGregors are going to have him for dinner very soon. Appalled that the turkey doesn't know that the farmer means on the table, not at the table, the two bunnies decide that they must tell William what he will not be pleased to hear...no, not at all! William, as any smug gobbler worth his salt would, does not believe a word they say until Peter surprises him with news of his own father's fate at the hands of the McGregors. William is desolate. The bunnies return home, worry etched on their faces concerning their new friend who is about to come to a gruesome end. While serving a time-out for forgetting to complete their assigned tasks, they make a plan. Will it work? Listening to Emma Thompson read this story on the included CD (as I am writing this post) makes my heart sing. She is brilliant at it! I am sure she couldn't possibly be happier with the result. The story itself is such a lovely new Christmas tale. It's wonderful to welcome these familiar and beloved characters, originally created by Beatrix Potter, back. In Ms. Thompson's deft hands they continue their adventures and I, for one, am delighted to join them. I do hope there is another on the horizon! Oh, I know who's going to get this book in her Christmas bag...Miss Kaya! 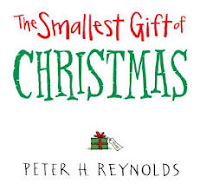 It is a perfect size, and is filled with so many of the memorable traditional verses that I knew as a child, and then shared with our own children. What a collection it is! "the rhymes are still important to me. They are lodged deep in my consciousness. 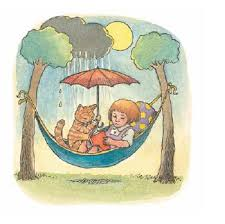 From them I learned about play and about work; about joy and sorrow; about manners, ethics, and dreams. These lessons do not grow old." Today, he shares them with his grandchildren! And now, he shares them with us...lucky we are! His familiar strong black lines, his expressive characters, his use of light and shadow, and his ever-changing design will have listeners begging for more. Those who are familiar with the rhymes will recognize favorite characters, whether human or animal, and will soon be able to chant the rhymes on their own. There is so much energy and delight on its pages! I love that he has chosen to include some 'concept' pages which are sure to garner further interest from young readers: Getting Dressed, My ABCs, Going Places with Henry and Bear, My 123s, action words, Shapes, Colors. They invite for rapt attention and encourage conversations when sharing. As brothers ought to be. Captivating, and what a charming and memorable gift for someone you love. "But just as he was going to eat it there came down to the beach from the Altogether Uninhabited Interior one Rhinoceros with a horn on his nose, two piggy eyes, and few manners. 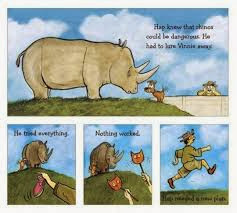 In those days the Rhinoceros's skin fitted him quite tight. There were no wrinkles in it anywhere. 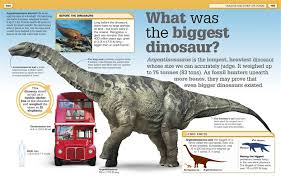 He looked exactly like a Noah's Ark Rhinoceros, but of course much bigger." "When I sat down to read them as an adult, I understood why she held them in such high regard. They are simply remarkable - magical and mythic, replete with stunning word play, vocabulary, wit, poetry and prose; global in their reach; and, as important for an artist, ripe with visual images. I was hooked. 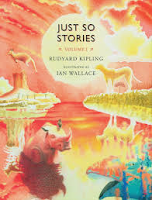 I couldn't wait to put my mark on Kipling's fertile imagination, which opened up a treasure trove of possibilities." Ian Wallace's invitation to us to share these classic tales comes on the remarkably designed cover. It wraps around the book and, in the beauty of the sunset and its transformation to the dark of night, gives us a visual hint at the stories to be shared in this first volume. I love that the reflections reveal the animals' transformations. If you are as observant as young children tend to be, you will take note that there are six tales to be told. 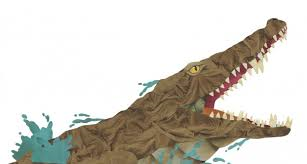 For each of the six stories, the artist has created four full-color, full page illustrations, using watercolour, pencil crayon, pastel pencil and chalk. Each scene is full of detail and light. The palette for each story is impeccably matched to the setting. The colors are bold when needed, and softened when the story calls for it. (Interesting to see what the whale has swallowed from trash-laden waters, and I love that the toys are in keeping with the times the stories were originally told!) In every case, one of the four is accompanied by a text selection. Don't miss reading the illustrator's note that follows the final tale. It is very enlightening concerning the process used for creating this luminous work. There is little to be said about the stories themselves. They are have been honored over the past more than one hundred years. It is wonderful to have a newly illustrated and very impressive collection of some of the tales. It is my understanding that Volume 2 will be on bookshelves in the spring of 2014. I will look forward to that with high regard for Mr. Wallace's work and anticipation of reading those marvelous stories one more time! "When she did look back, she saw Paul bow his head, then slowly unfold his hand to reveal the photograph he had torn from the album. With surprising gentleness he smoothed it out upon his lap and gazed down at his younger self, while Knife watched, her anger melting into perplexity. Why that picture, she wondered, of all the pictures they had seen?" I did not set out to love this book. It is not a book that I would generally choose to read. But, it is on the list of juvenile intermediate fiction that our jury is currently reading for the Canadian Children's Book Centre and their upcoming spring issue of Best Books for Kids and Teens. That is what I truly love about being on the jury...I read books that I might have missed. I am certainly happy that I spent time reading about a family of faeries who live in a huge old oak tree called Oakenwyld. They no longer have the magic they once had, and their numbers are quickly dwindling. 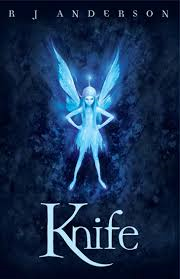 Knife is the lead character, a brave and capable hunter within her faerie family. That honored role allows her to be outside and she rejoices in it, as she has spent too many years wishing she could be away from the confinements of her quiet room within the tree. She has been warned often about the dangers from natural predators and of contact with humans. Yet, when she meets Paul, a man confined to a wheelchair following an accident, she feels no concern for her own safety. She enjoys the time they spend together, and learns much about the outside world during their conversations. The characters are equally compelling and entirely unique , the world created is elaborate and intriguing, all of the secrets kept enrage, and the winding path toward discovering the mysterious events that have brought the faeries to this place in time kept me reading long into the night, and always eager to see what might happen next. Can Knife trust Paul to help her find the answers to her many questions? In this classically traditional tale of faerie lore, readers will find secrets, mystery, friendship, great love and romance. There is little kindness within the faeries' world until Knife breaks the mold: she disobeys the Queen, she shows daring and bravery in the face of obstacles and sadness, she makes friends with a human who is as much in need of her as she is of him, and she is dogged in her search for the truth that will ensure the future of her faerie world. It is a story worth reading. Now, I am off to read the sequel, Rebel. LUCKY ME! he was still pretty big." Before sharing this inventive fractured fairy tale, ensure that young children have heard the traditional version. It will make the reading so much more meaningful. The story is pretty much untouched...there are three bears, they do leave the house for a walk while food is cooling, and they do return to find an intruder. The similarities end there. These three bears are of the polar kind, totally in keeping with the time of year. Mama is making Christmas pudding. No surprise there. 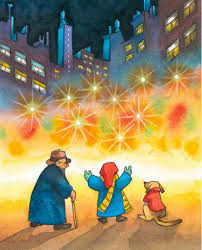 While it is cooling, they venture over to the nearby village to take in all the twinkling Christmas lights. 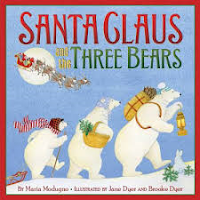 Papa carries a lantern, Mama has a walking stick, and Baby Bear tugs on a sleigh. While they are out, Santa is delivering the evening's gifts to the northern hemisphere. He is on the lookout for the bears' house as he has presents for them all. It's been a long night. Santa needs a breather. So, he has a look around and...you guessed it, he finds the cooling puddings and is delighted (he's had enough milk and cookies for one night). He tastes the puddings, sits to rest on the assembled chairs, and finally succumbs to fatigue when he discovers the upstairs bedrooms. "They saw lots of white hair, a red jacket covered with soot, and, sticking out from the bottom of the blanket, two black boots." We know exactly who it is! Not resorting to Goldilocks' method of departure, Santa does what he is there to do and off the goes to finish his night's work. Young children will love to see the size of Baby Bear's gift...and are sure to hope for some of the same! Jane and Brooke Dyer use watercolor and gouache to create 'just right' art for this delightful edition. There is a lot to see, and little ones are sure to notice the many tiny details that grace this book's pages. I think you'll like it. I know I certainly do! It even had a water fountain. This tiny king will immediately capture the attention of the children who share his story. He looks a bit like he's made from Lego. But, not quite! We can easily see just how tiny he really is. In fact, the front cover encourages us to consider it with a note posted beside his green leg (This is the actual size of the Tiny King). On we go! 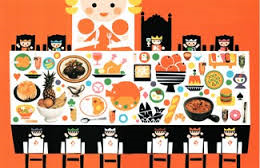 His castle is enormous, his army numbers many and the soldiers are huge, his dinner table is overwhelming, even his horse is so big that he cannot possibly ride it without incident. The poor guy! Sleeping alone is no fun either; but, when he falls in love, his troubles dissipate. Happiness reigns when the contented couple welcomes a menagerie of TEN children! The soldiers are sent home on vacation. Laughter spills from castle windows, stairwells, and the outdoors. 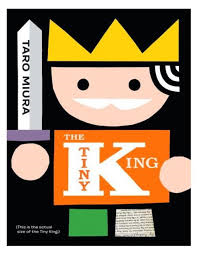 Now that he has someone to share his life with, the Tiny King enjoys that life as he has never done previously. All is well! I love the graphic geometric shapes, the bright colors, and the sense of perspective that preschoolers will discover as this book is shared. Be sure to note the changes in background color as the king's life changes. The stellar design uses digital collage that is sure to attract just the right amount of attention...deservedly so! Full of heart and offering a commendable life lesson, it is bound to be enjoyed by all. I have a friend who leads workshops in writing for all ages. Borrowing ideas from the brilliant Lynda Barry and her equally brilliant What It Is (Drawn & Quarterly, 2008), Don encourages those who attend to mine the details of a memory for writing workshop, or for their own purpose. I have been at three of those workshops, and I even surprise myself with the topics I can walk around to find a memory for writing. 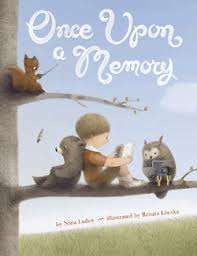 Nina Laden uses the concept of memory to create this lovely, quiet poem that is sure to trigger deep thoughts for many. She encourages us to think about familiar objects in our environment and to consider what their memories might be. I found myself thinking imaginatively about the origins of a number of objects once I had read this beautiful book. What a concept! by the artist's experiences with nature, from her worldwide travels to her own backyard." Each image created is a perfect accompaniment to the warmth and charm of the questions themselves. As the small boy asks the question, the artist provides a tiny scene showing familiar gentle animals that perfectly depict the notion he has expressed. Take perfect words, add exceptional illustrations and you have the recipe for a book to love and cherish. I LOVE this little treasure. Also, I wanted to share with you a talk given by Lynda Barry. It may give you pause! He loved the North Pole. in the shape of people. As we wake up this week to wind chills that hover in the -40 range, I understand why the Claus family was not content with life at the North Pole. I mean, it is even colder there than it is here! So, when they decide that life in Florida is much more appealing, a move in imminent. 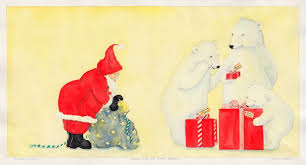 Santa, the youngest of the Claus's seven children, is the only one who seems put off by their choice for a new life. "I can shimmy up the chimney!" He does just that. 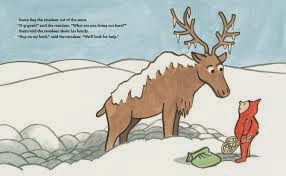 As he wanders about in a winter wonderland, he manages to dig a very cold reindeer out of a snowbank. The reindeer can fly! Soon they find a house with a light shining from a second floor window. Inside, Santa discovers a group of elves, just itching to help him rescue his family. It's off to work they go, and soon have fashioned shovels and a sleigh. Their mission to find Santa's house begins. The Claus family are patiently waiting for rescue when the dog hears a noise in the fireplace. Can it be Santa? What do you think? 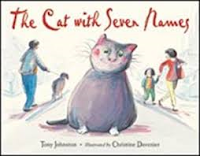 This is a wonderful new picture book that will be enjoyed throughout the year, and for many years to come. Jon Agee uses his very distinct and considerable artistic skills to bring us an explanation for how Santa chose the perfect profession for himself. Using watercolors, outlined in thick black lines, he creates a family and setting that is sure to capture attention. He is a master in the use of white space, droll characters, and perfect timing for each turn of the page. It's a wonderful story and worthy of your attention. tarnished with ashes and soot. peddler just opening his pack." Do you think it's true that everything old can be new again? I can't tell you how many different versions of Clement C Moore's Christmas classic I have read and shared. I can tell you that I am a dedicated fan of Barbara Reid's extraordinary art. Put the two together, and you definitely have something old made brand new! You are in for a truly wondrous time when you share her new book with your loved ones! From the shooting star in the deep blue winter sky that graces the endpapers, to the many charming details found on each and every page you will be captivated and in awe of her talent to take Plasticine and work her own kind of magic for this well-known poem. There is nothing I can tell you about the poem itself, as you are sure to be familiar with it. I hesitate to tell you much about the illustrations because I cannot possibly do them justice. You have to see them for yourselves to really appreciate the impeccable work that goes into their design. 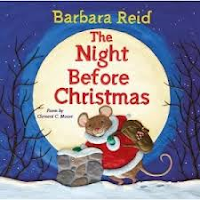 I will tell you this: Ms. Reid has reimagined the story using mice as the characters who welcome St. Nick on Christmas Eve. They are exuberant as they hang their familiar gray work socks and trim a tiny tree which is set in a thimble. They giggle and cavort. Their home is a cozy wooden log, and their house is full. Every tiny detail is intricately designed to delight her audience. I found myself going back again and then again to see what I had missed the first time. There is so much to see and savor! I'll search here and there. 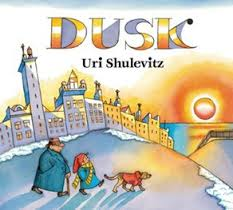 and toys for my boys,"
Master storyteller and artist Uri Shulevitz begins his story simply. It's winter and a grandfather, his grandson and dog are out for a stroll on another of winter's short days. At the river, their eyes are drawn to the brilliant beauty of the sun's light as it says farewell to that short day. The boy is sad. The quiet moments of the earlier walk are contrasted with the energy of the city as they stroll amiably along its brightly-lit streets and avenues. Mr. Shulevitz's art is breathtaking. He fills the pages with light and shadow, spectacular color which is both warm and cool, and details that are sure to inspire conversations about what is happening at every turn. It is a worthy companion book to Snow (Farrar, 2004). If you want to experience the magic that light can bring to a winter landscape, you need to see this wondrous book! It is a journey you will want to make in order to truly appreciate the beauty of this holiday season. on in! The water's dandy!" how to paddle in the water. Poor Little Chicken Duck...she has a fear, just as so many of us do. Frog tries to convince her to give the water a try, but she is scared and doesn't understand Frog's love for the cool of the pool. He's persuasive, but she is adamant she won't go in. Till I learned that they were only fireflies. As I bravely fly through moon-and-starlit skies." The lark has something to say about not fearing the dark, but what about singing? The robin, cuckoo, some quails, and even the American eagle voice their own fears and how they faced them. 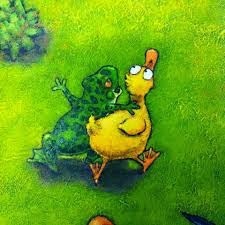 It's enough to give the little duckling the courage to go right back to the pond with Frog and see what happens. Kids are sure to get a kick from the surprise ending! This is a book that will generate discussion about those things we fear and what we must do to deal with each one. It will be most interesting to hear what children have to say and to listen to ways in which they encourage their friends. Bill Slavin, once again, creates soft-edged acrylic artwork that has great appeal for those who love varying perspectives, vulnerable and lovable characters, and lively action. It's sure to be a hit! I have such admiration for Steve Jenkins' work! I have often wondered when he sleeps. He is a prolific author and truly remarkable artist. I have joked when using his books in workshop presentations that he must lie awake at night thinking about new questions to ask concerning the animal world. Hmm...'what do you do with a tail like this?' or how many beetles are there in the world? or 'just a second', what can be done in that tiny amount of time? What a fascinating man! "Reading and writing about animals over the years has introduced me to some extraordinary creatures. And I've learned that many familiar animals have extraordinary abilities. 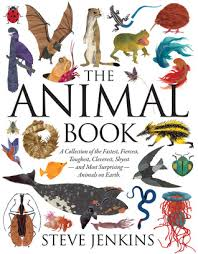 This book brings together more than 300 of these animals - the exotic and the everyday - and describes some of the amazing things they can do." We should thank our lucky stars for writers whose passion for a subject makes our reading lives so engaging and enlightened. I have been poring over this book since it arrived in the mail, and cannot help but share some of the truly wondrous things I have learned in a very short time. I would love to regale you with these tiny tidbits, but you can read it for yourselves. It is brilliant! His love for this fascinating world is evident on every page. The images are so authentic, and are organized in a way that will keep readers turning pages and returning to favorite images. The design of each page has been given careful thought and has immediate appeal for anyone sharing this book. "A family of shrews makes its way across the forest floor at night. A baby shrew could easily get lost, so the group forms a line. The mother leads and each little shrew holds on to the brother or sister in front with its teeth." Each section ends with a double page spread that is sure to delight and inform...and perhaps even astonish, and a chart of further information about the topic explored. 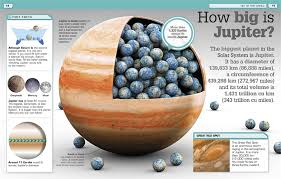 He ends his book, as he often does, with 'more animal facts', using thumbnail images and additional information. They are presented in alphabetic order and contain page numbers so that a reader might return to a favorite page easily. 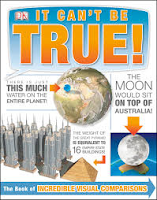 Length, habitat, diet and a specific fact makes up the text for each inclusion. As if that weren't enough, he then shares ideas, research, his art, and a timeline for a new book from idea to publication. BRAVO, Steve Jenkins! "...and was followed by a hundred more books that were created in the attic studio of our old farmhouse. The changing seasons in the woodlands, fields, and streams that surround the Sandy Hook village provided an idyllic environment for raising a family. Those scenes and memories inspired these illustrations." encouraged others to create paper snowflakes to bring hope to the students as they returned to school, had a huge impact on her decisions lyrical story she tells. 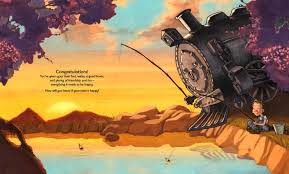 Creating the beautifully compelling illustrations to match his friend's soft and lovely words helped Mr. Kellogg begin to deal with the overwhelming sense of loss so many were sharing. 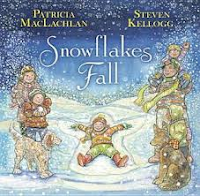 Patricia MacLachlan had the words, Steven Kellogg the art...together they have created a story that helps to restore the joy that is innate in children when snow falls and the seasons change. We sense a renewal of our belief in the cycles of our lifetimes and the great joy that memories eventually bring. And fields of snow angels." May the angels that died that day know they live in the hearts of so many....all beautiful, and missed. I will ask her anyway. "From her tree, Koala hollered, "Xander, I am not a bear." bear?" He stared at her in consternation. we're rather rare. Will I not be welcome there?" I love the lilt of the language! Matt Phelan's accompanying ink and watercolor art bursts with expression and changing mood on every page. The loose lines and many added details (Xander shaking hands with the tiny orange Amanda Salamander) give each of the animals depicted a singular personality. I have too many favorites to mention, and you are sure to find your own! Food and fun and jubilation!" Thankfully that will be the end of the stumbling blocks, or will it? In fact, the story ends perfectly! Oh, please get this book to share with your kids at home and at school. They will love it, and want to hear it repeatedly. You won't mind! Here's another of those remarkable books from DK that teach you what you didn't know you wanted to know! From front to back it astonishes with little known (or considered) facts that will have you opening your eyes wide and wanting to share that new knowledge. I can just hear young readers at the dinner table offering the fact that a blue whale's heart is as large as a car, that the number of people killed by the Black Death would fill 827 Rose Bowl stadiums, or that the average human body contains approximately 100 trillion cells, and 10 times that number of bacteria. Did you know that you wanted to know that? The book is divided into sections for quick reference, and they include 'out of this world', 'astounding earth', 'humans and other life-forms', and 'feats of engineering'. Each section is then divided into questions and data. Having just celebrated another birthday, I went straight to "How old are the oldest animals?" "Ocean quahog clams are known to live for more than 400 years. Scientists think some sponges may live even longer." Okay, you're safe. I have no intention of living that long! A timeline at the bottom of the page shows hourglass timers that range from an elephant (86 years)) to the quahog (405 years). It's a great graphic. You'll be saying 'WOW!' and you will be wanting to share what you have learned. It will be the same for kids who read this book. Isn't that what we want for them? What a brilliant book this is! Try to get a copy from your local bookstore, or from the library. 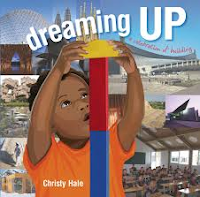 You will be dazzled by the way in which Christy Hale combines children with architecture, and how she shows that what they do during their play resembles many of the world's astonishing structures. The text is poetic, the idea of pairing children's play with buildings around the world quite unique! The book is created using two-page spreads. 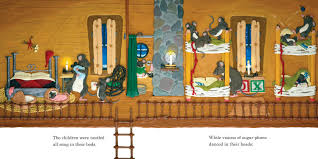 The one on the left is illustrated with mixed media collage showing children playing with such common playthings as stacking cups, mud pies, cardboard boxes, blankets, wooden blocks and more. They are faced on the right side with well chosen photographs of a variety of architectural constructs from around the world that match what the children are doing in their play. Awesome! Each is accompanied by a concrete poem (as I tried to show above). You really need to see them to appreciate the remarkable creativity in design. "The process I go through in art and architecture, I actually want it to be almost childlike. Sometimes I think it is magical." - a very apt description of a child's play! "Also known as Ping-Pong, table tennis is a fast-moving and physically demanding racket game. Players play as individuals or in pairs, and win points by hitting a lightweight ball over a net so that their opponents either cannot return it or are forced into an error. Most matches are short and sharp, and the rules have ways of dealing with games that go on too long." Ah, now that description brings back memories from my youth...and my exceptionally talented brother who played a mean game of Ping-Pong. And I MEAN it! He only had to whip it past me a few times so fast that I could barely see it before I slammed down the racket and departed. No competitor was I! The referees would have dealt with my gently lobbing means of playing very quickly. No matter which book I receive from Chris at Tourmaline Editions, I am always impressed by the knowledge I garner while poring over their books from DK Publishing. The editors there do an exemplary job of compiling information that is sure to interest a wide audience. 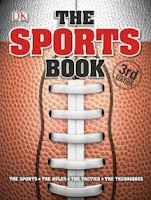 "There are more than 200 sports in this book - team sports, racket sports, combat sports, water sports, winter sports, target sports, sports on wheels, motor sports, animal sports, extreme sports - and more than enough information to make you an instant expert on almost any competition you're likely to encounter." I like that it begins with the Olympics, since it won't be long until we are watching from afar as our national athletes compete on the world's stage. From Athens to Paris, from St. Louis to London and up to Sochi in 2014 and Rio in 2016, each of the venues is included, accompanied by a brief description, sporting highlights and a star profile. The Paralympics are here and the text offers highlights as well as criteria, adaptations and some of the stars of the Paralympic Games. Then, we move right on to the sports themselves. Each double page spread offers an overview, stats, information boxes, captioned and clear illustrations to help readers understand what they need to know about the sport being described. As is true with the multitude of brilliant nonfiction books that DK produces, this is a book that holds appeal for so many, of all ages. You are sure to know someone who would delighted to find it under the Christmas tree! "I went out for the paper once, in the cold of dawn. Left the door ajar. With my walker I moved slow as molasses. So a cat slipped in. Just like that. My family's grown and gone, so this little bit of company felt nice. Kinda filled up the house again." If you are a cat-lover, this is the book for you! Oh, and if you are an aficionado of beautifully written and illustrated picture books, it is also for you! It's really a book for everyone, and will be enjoyed each time it is shared. I guarantee it! 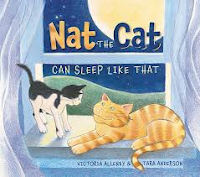 "I was resting on the sidewalk, struggling to sleep, when this cat drifted up real quiet-like and rubbed hisself against my cheek. I nearly jumped out o' my skin, thinking it was the enemy come to get me. I was spooked. But ol' kitty, he remained calm. He didn't push me toward friendship. Just sat." When a close call brings the cat back in contact with his owner, the rest of his benefactors are brought together in their concern for his welfare. Only now do they discover the secret life he has been leading. They also make some special connections within their small urban community. Stuart Little, Kitty-boy, Placido, Mooch, Dove, Mouse and Regis reveal themselves to be a charmer whose wanderings have brought joy to the lives of everyone he meets along the way. Christine Davenier adds the perfect touch with ink and colored pencil artwork. Most of the action happens on double page spreads. Each community character can be found on the front and back endpapers, allowing readers a chance to see how the appearance of a cat can transform the course of a day for each one of them. The first person voice, the shifting style for each new caregiver, and the varied issues that color their lives provide many opportunities for further discussion. This is a gorgeous book that will be enjoyed by all. they ended up in the water. Not always do good friends agree! So, when the decide to take a canoe trip on a lovely sunshiny day...it turns into a fiasco! First, they cannot agree on who should do the steering. 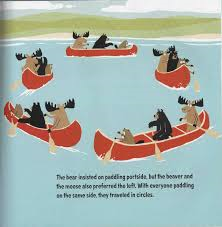 Then, they all want to paddle on the same side of the boat. Anyone with boating experience will know how that works out for them. Solving that problem happens just as they come to a beaver dam. How can the decision for crossing it be so complicated? A portage works! It's not long until hunger and splashing assure another argument...and a scary result. Does a near disastrous ending to their afternoon excursion end the bickering? It does not! Finally they realize that, unless they choose cooperation as an option, they might be stranded on the river rock for a very long time. Shaking hands, setting their sights on home and enduring a number of scary incidents, they finally make shore in need of a nap. This is the fourth time we have been lucky enough to spend time with our woodland friends. Life in the Wild? Indeed! 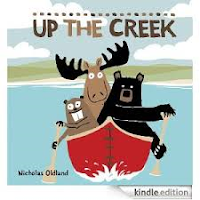 You will love these cartoon characters, their humorous escapades, and the gently learned lessons.